You are here: Home › Frequently Asked Questions › Who should you appoint as your Attorney? Your Attorney, or Attorneys if you appoint more than one will be able to take full control of all aspects of your life and will have full access to all of your assets and they will have full responsibility for dealing with those assets on your behalf so as to ensure your best interests are met for the rest of your life. They will be able to take all decisions about what investments to make and about when to sell assets and when not to. They will be able to make all decisions about renting your house or not if they feel it is appropriate and they will have full responsibility for the ongoing discharge of all of your outgoings. It’s extremely important that the person who is nominated as Attorney is someone who you feel will be able to fulfil all of those requirements and who you trust will be impeccably honest in all of their dealings for you. You also need to consider the age profile of the person you plan to appoint and to consider whether, if you would intend to appoint someone of a similar age to you, you should also appoint a second person, possibly one of your children, to act as a second Attorney who can assist your first choice of Attorney if necessary. 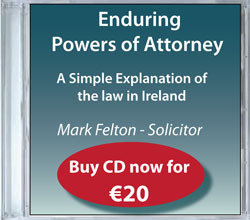 The Enduring Power of Attorney enables you to choose how many people are appointed to become your Attorneys. These are the type of day to day decisions you would ordinarily make without thinking about and which in the ordinary course of life would cause you no difficulty. It can be a great source of comfort to know that your nominated and chosen person is able to make those decisions for you. Appointing someone as your Attorney a position of great responsibility and it’s therefore one that must not be entered into lightly.